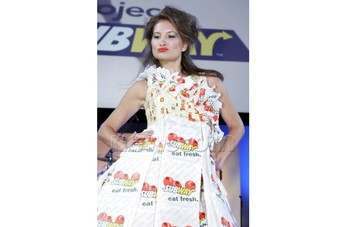 Sandwich maker Subway has proudly put its name to this dress at a recent fashion show, just don't wear it in the rain. Chicago-based costume designer, Elsa Hiltner, created the design with recycled packaging used in Subway restaurants. A total of eight designs took to the runway for the Project Subway fashion show, where the takeaway chain boasted its environmental credentials. One model wore a bodice created from a lunch box package, with floral detail made from a Subway Cookie Bag. The catwalk show isn't Subway's only link to fashion either - although it is certainly the most glamorous - because it turns out that the chain's mops contain recycled cotton from socks and t-shirts. Unfortunately, it is likely to be the mop, rather than the dresses or the models, that makes it into your local Subway.